On Thursday, the social networking giant launched Facebook Gifts – a new social gifting service that allows users to purchase real gifts for their friends, have them shipped and have a preview of the gift pop up on their Timeline. 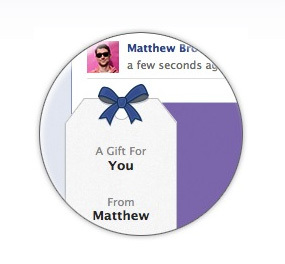 Facebook will even give users the choice to send a gift in the “birthday reminders” section on the right hand side of the page. Investors are salivating over the monetization possibilities, as just a minute amount of adaptation could result in a windfall of cash for Facebook. However, this feature has already raised some serious privacy concerns. Experts also caution that hackers and spyware creators could take advantage of people’s natural curiosity about gifts to exploit them. Click here to see Facebook’s complete overview of the feature. What do you think of ordering and sending gifts over Facebook? How is it different than other forms of e-commerce? Would you trust it more or less?